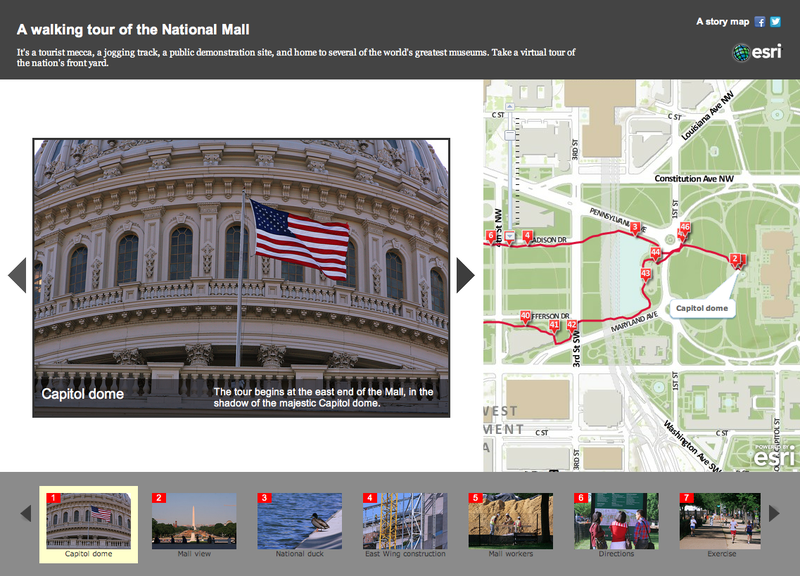 We’ve been developing story maps for over a year now, and from the start we’ve defined the term liberally. Many, even most, of our stories are non-linear; that is, they allow the user to browse and wander through the story at will. 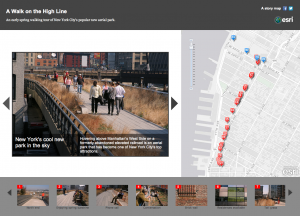 We’ve organized these stories using elements such as headlines, text blocks, map legends, and user interfaces that help guide the user through the map. But there’s no “correct” sequence by which users are supposed to navigate through these story maps. Traditionalists might insist that a story is by nature linear. Written or oral stories are in fact linear narratives. Even stories that jump back and forth in time are written and read in a linear fashion. The mediums of text and the spoken word require it: you can’t tell, read, or listen to a story all at once, or back to front, or at random. It’s at least theoretically possible, perhaps, but doing so makes comprehension difficult. Geography is essentially non-linear, although components of it are sequential. One travels through a landscape in a linear fashion, just as one can view change over time in a sequence or series of maps. But spatial relationships are complex and multi-dimensional. Confining geographic analysis to two dimensions robs it of much of its richness and texture. On the other hand, many geography-based stories are linear. A travelogue, the migration of a bird or mammal, an explorer’s route, and the path of snowmelt from mountains to sea are best depicted in narrative form. Which is why we developed our Map Tour template. 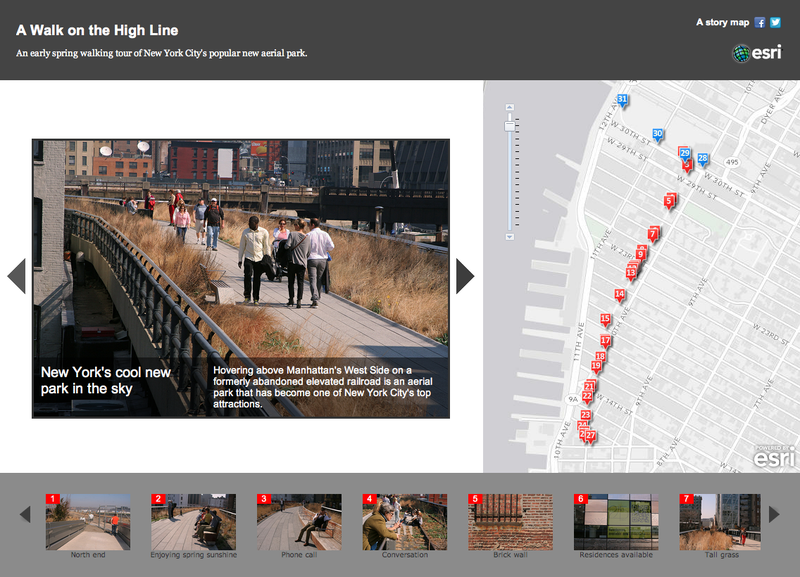 We prototyped the template with our “Walk on the High Line” story. 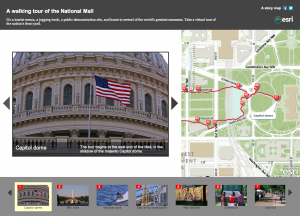 Story maps team member Lee Bock, who has long experience with Adobe Flex and Flash, developed it as a Flash application. I took advantage of a business trip to New York to walk the length of the park on a lovely spring day and document it in photos. I used the same method during a trip to Esri’s headquarters in Redlands, California to document a walk around campus. The Walking Tour uses a different template we call the “playlist.” It’s less strongly narrative in form, and it places greater emphasis on the map. We’ll be making the playlist template available soon. The method I’ve described for compiling story maps is fun, but it’s admittedly somewhat tedious, and it involves multiple steps. For that reason, we’re working with Esri’s mobile team to develop an iPhone “Story Builder” app. When the app is completed, subscribers to ArcGIS Online will be able to create and save a feature service as a web map. When they get into the field, they’ll access the web map ID via email. The app will record the GPS track, and any photos, notes, and captions made by the user on his or her device will automatically be added to the feature service. 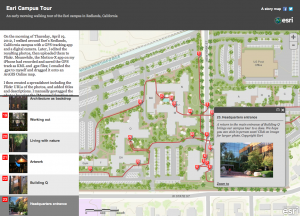 When the user returns to home or office, the map will be ready to edit and publish on ArcGIS Online. I can imagine myriad uses for this powerful combination of mobile app and web map, for everything from scientific observations to personal travelogues. You can download the Map Tour template.